Yesterday evening, Bradley got a bee in his bonnet. One of his friends at school had arrived at school that morning with an impromptu paper he’d done on some animal… and Bradley wanted to do the same. 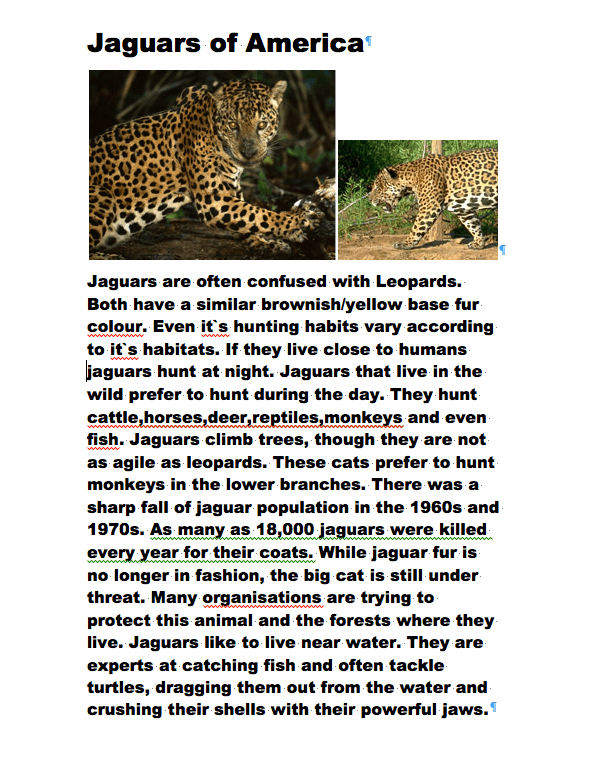 So, last night, he went through the umpteen animal encyclopedias that he owns, and found articles about jaguars, and decided that was going to be the topic. And he told me that he wanted to do it on the PC, not on paper. Fair enough. This morning, I left my MBP on for him, after opening Word (he didn’t know where it was on my Macbook compared to what it looked like on the school computers) . I also told him that I would help him with images this evening if he wanted to add them. Wow! I didn’t know he could do that! I just needed to help him print, but I reckon he’d be able to do it all next time. Should I change the way I pin? Oh well done to him! WOW! how eonderful. I loved reading it. 🙂 So cute. That’s very clever…well done Bradley! Wow ! Clever boy ! He showed it to me when I collected him – very impressive! Thats pretty darn impressive! Does the school give “extra credit” marks for this kind of thing?